Hey sallydog, i’m about to go by my 2012 super 10 array and a small motorcycle trailer. Do you still have the hitch? I am very interested in it if you do. The set up on my 1st S10, towed a camper trailer all the way around Australia. Wow LoftyBob, that is a great looking rig and set up. On Monday (08/20/18) I pick up my 2012 Super Tenere in Salt Lake City Utah and then I’m driving the S10 to just west of the Nevada/California border (above Lake Tahoe) to pick up my new camper trailer, which looks very much like yours. But I don’t have the hitch and my son and I are going to have one constructed. Did you have your hitch custom-constructed or get it from a manufacturer? If you happen to remember the manufacturer’s name and contact info, I would greatly appreciate it. Do you still have your S10? RIDE ON ! Somebody is an Artist with a tubing bender. That's purty. It was built by a friend of mine (Wayne) who owns Shadow Trailers here in South Australia. He custom makes tow bars and he manufactures trailers as well. PS. I have sold that Tenere, and now have this one. The new bike is beautiful. I want to ask you, “how do you like the clear winglets by the front blinkers”? Do they deflect much air? There's a solid difference with those on and off. It turns out I built my own hitch. But I am now perplexed by the electrical connection challenge on the bike... for the trailer. I went down and got the Hopkins converter kit #46155. I just took the seat off of the motorcycle and I have access to all the wiring harnesses in the back. I’m having a hard time isolating the blinker and brake light wires. Do you have any memory of how you found those particular wires? Any help you can offer would be greatly appreciated. 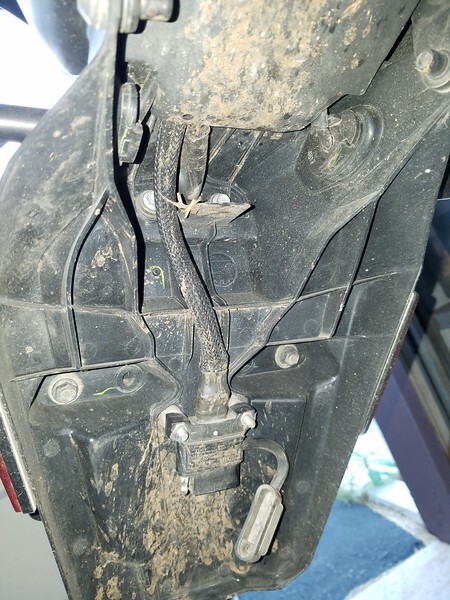 I hooked mine up beneath the rear seat and have the connector inside the rear fender with a rubber cap. 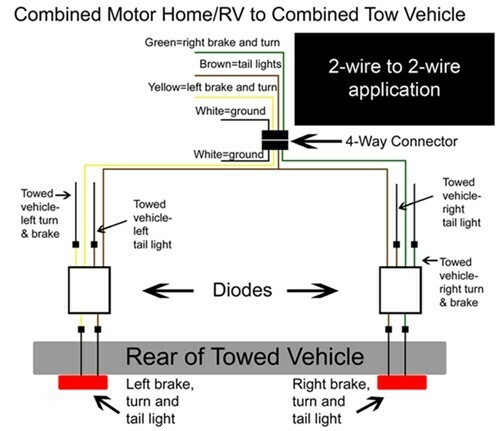 The reason you can't separate the blinkers from the brakes is you need isolation diodes. The Hopkins has those diodes built in. A glitch I see is if you're bike has the Gen II LED turn signals, then you'll need a powered module. I've always used a powered module just to eliminate any flasher speed issues regardless. I bought the diodes and simply soldered them in. Don't remember the values, but easy to Google.